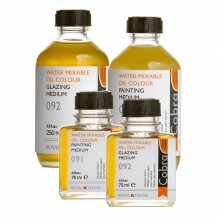 Cobra Water Mixable Oil Colours provide a perfect oil paint result with a uniform drying time and degree of gloss. Painting with Cobra paints is much like painting with traditional oils. The paint can be applied using all the usual oil paint techniques. The colour, as well as the brush stroke or applied texture, retains its full expression after the paint has dried.